The Revolutionary challenge from The Legal Genealogist yesterday got more than 80 percent of the way there in less than 24 hours. The deal is simple: for every one of the first 50 readers who support the Kickstarter project for “Revolutionary Voices”: A Last Muster Film, I’ll donate another $5 of my own money. You kick in $10, you’ve caused a $15 contribution. And that’s on top of what I’m going to donate on my own account. Two more folks joined in this morning, so there are only eight to go to make me put my money where my mouth is. As I said yesterday, it’s a great project — bringing the faces and the stories of Americans who lived in the Revolutionary War era — and lived on long enough to be photographed — to life on film. So why do I care? What makes this project one I’m so happy to support? There are three answers (that I know of, so far) to those questions. David Baker. 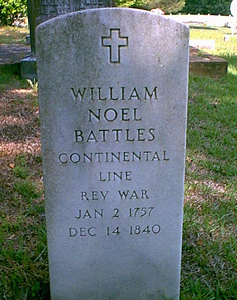 William Noel Battles. And Elijah Gentry Sr. They are, respectively, my fourth, fifth, and fourth great grandfathers. And they were Revolutionary War soldiers. Where he fought, with whom, in what units… all unknown. But serve, he certainly did. None of these men, you can see, lived into the era of the photograph. David died in 1838. Noel in 1840. Elijah by May of 1818. I will not see their faces or learn more of their personal stories in “Revolutionary Voices.” But I can hope, by supporting this project, to learn more of their time, perhaps even of their units through the stories of comrades with whom they served. David. Noel. Elijah. Keeping the history of their time alive will help keep their sacrifices and their courage alive — and that’s worth every penny to me. Although you may not learn something new genealogically, you always learn something from reading your blog posts. In this case, we learned something historical and just as fascinating. Thanks for the kind words, Jeff! Karrie, hello from a cousin! 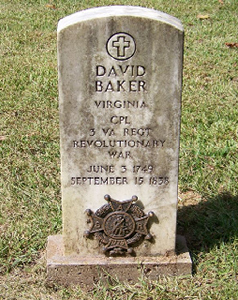 I assume you mean that David was a 3rd, 4th or 5th great grandfather — this particular David Baker would be a bit too far back to have been your great grandfather — he died in 1838. I’m afraid that both of those stories (the gunpowder and the George Washington stories) are entirely unsubstantiated. There’s not a single shred of evidence to support either one of them, and much negative evidence. For example, gunpowder was so important to the Patriot cause that there were dozens and dozens of reports whenever anything affected the gunpowder supply — yet there isn’t even a hint in any record that Thomas Baker, David’s father, was involved in the business. Moreover, neither David nor his brother mentioned any such thing when they applied for pensions (and it would have made sense if their father had been killed in such an explosion). And it’s an unlikely occupation shift for a farmer/planter of Thomas’ age. So I’m afraid we have to put these tales in the “nice but not true” category.